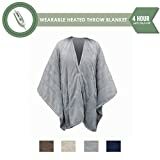 No matter whether you're in a frigid office, at a freezing outdoor sporting event, enjoying a crisp fall day on the patio, shivering in a chilly airline seat, or just doing things around your cold, drafty house, just slip this cool new Cordless Heated Cape over your shoulders and quickly warm up without being tethered to an electrical outlet like traditional heated blankets require. 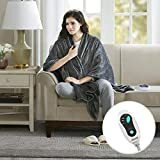 This innovative, cord-free wearable electric blanket is worn just like a stylish cape that drapes over your entire upper body. 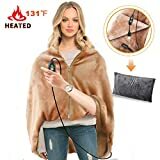 It uses a lightweight, rechargeable battery pack that provides enough power to produce 115º F of warming heat through thin, imperceptible wires embedded in the soft, plush polyester fabric for up to up to 140 minutes per charge. 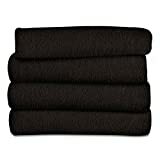 A cool way to stay warm on the go and makes a great gift.